I grew up with a dad who honked his nose into one of his many "hankies" umpteen times per day because he had hayfever. As a kid I always giggled at that loud honk, even tried to do it myself because I thought it was funny. I never knew the agony that he went through until now. I turned 30 last fall and up until this year I have never had much of an allergy problem. I am extra sensitive to dust and mold but really who isn't. Well this year our spring came early and early March my home state of Michigan was seeing record high temps in the 70's and 80's! I guess all that warm weather must have caused more plants to bloom and grow than usual because all of the sudden allergies hit me hard. My eyes itch, my nose itches, my throat even itches and burns! I can't go 10 minutes with sneezing myself into a fit LOL. Thankfully a kind pharmacist at my local drug store helped me out and recommended Claritin last year and I've used it ever since. I can go about my mommy life without the red eyes and irritating itch, I love it! I am so thankful for some relief. My husband and I have three children, our oldest daughter M is 8 and she has no allergy symptoms. Our middle son L is 6 and he has shown some signs such as an itchy nose that is runny. The youngest is our son K, he is 19 months and I am seeing allergy symptoms in him for sure. The poor little guy walks around scratching his little nose and rubbing his eyes all day long. I feel terrible for him, especially since I now know how he must feel. 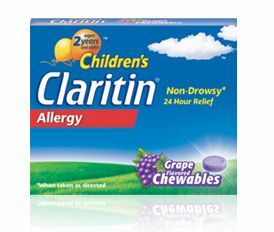 I decided to trust the brand that I was using for myself and buy some Children's Claritin for my boys. My 19 month old is a huge child, he was 10 lbs when he was born with a 15 1/2" head if that gives you any idea. I called my pediatrician just to check and she gave me the go-ahead to give him the Children's Claritin since he is so big. You should definitely check with your ped if your child is under the age of 2 if you wish to use this, they can help you out and let you know if the dosage is safe for your child. Now my poor little guys can have some much deserved allergy free days of play in this gorgeous weather we have been having. 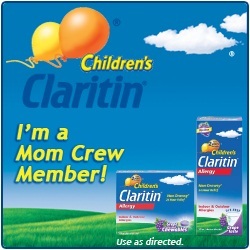 I am pleased to announce that I am a Children’s Claritin Mom Crew Member ambassador! This means that I will be able to share product details, news, and tell all of you the experiences and improvements I notice as my two boys and I go through one of the worst allergy seasons for our location ever. To help you out right now, Claritin has some great coupons that you can print. Also be sure to "like" their Facebook page so you can stay up to date on product news and allergy tips.